I thought I’d be moving this month. I cleared my schedule and hunkered down, fully prepared to pack up and move into a rental. That’s not happening. 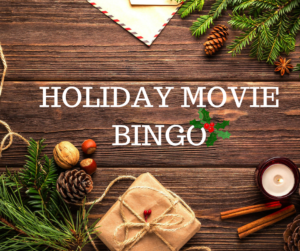 Quick aside: scroll to the bottom of this post for a link to the Cheesy Holiday Movie Bingo pdf that Tristan and I created. After much deliberation and advice from trusted team members (the only way to get through major transitions is to build a good personal team), I’ve decided to stay put until after the holidays. Our house goes on the market in February and I’ve done a lot of work to get it ready. Moving is stressful under the best circumstances, but it’s more stressful when it comes as the result of divorce. March 2019 will mark the five year anniversary of my divorce and although this move was agreed upon and anticipated, it’s still hard for me. I want this move to bring a fresh start, but packing up the house we’ve called home for ten years is emotional. I’m craving change, but it’s hard to claim the fresh start you crave when you’re tied to a school district for the sake of your children. Don’t get me wrong, our school district is amazing, but housing prices here are getting ridiculous and I’ll need to rent for a few years before I think about settling and buying somewhere else. I love our community, but part of me wants our fresh start to be in a new town. No doubt this is a stereotypical divorcee reaction. Knowing our next home will be temporary is weird for me. I’m a five to ten year plan kind of gal and having to let go of that makes me anxious. I want to dig into something new, healthy, and productive. I want to plant seeds that will thrive and grow as I tend them. Instead, I’m dragging the weight of my limitations into this next chapter and it’s bumming me out. It feels like a dangerous thing to say out loud, but I need to. And yes, my children are amazing and the time and energy I spend on them is worth every ounce of effort. I wish there was a way for us all to be fulfilled by the same path. That’s a dilemma every parent knows well. I don’t believe in ‘Happily Ever After’ anymore, but my ‘Happy Enough to Sustain Me Through Whatever May Come’ still feels a ways off. I have faith I’ll get there, but the in-between is drudgery. So, now that I’m waiting until after the holidays to move, I have space in my schedule. Instead of filling that space, I’m going to enjoy it and let it combat the drudgery and rejuvenate me. I’ve worked hard to get the house ready to sell and although there’s more to do, I’m going to pace myself and enjoy the holidays with my kids. In that spirit – bring on all the cheesy Christmas cheer, dammit! And yes, I know, it’s early. We still need to celebrate Thanksgiving. Normally I wait, but not this year. From my household to yours – here’s a little game to get us started. Cheesy Holiday Movie Bingo (click on the link to access the pdf. There are 6 sheets. Each one is different in case you want to play with a group). Enjoy!